"1: Organize. 2. Organize. 3. Organize," says the well-beloved author, educator, climate activist and co-founder of Step It Up. Only then does he add his fourth piece of advice: "After that, if they have some energy left, by all means change the light-bulbs." And to the young climate activists who are putting together a growing and increasingly sophisticated youth climate movement, McKibben says, "Keep it up!" This weekend, over 5,000 young leaders will converge in Washington D.C. for Power Shift 2007, the first-ever national youth climate summit, organized by the Energy Action Coalition. Back at home, tens of thousands more youth will be joining in hundreds of actions in their home communities as part of the second nationwide Step It Up day of action, November 3rd. Energy Action/Power Shift Team: With Power Shift on the horizon, what stage of development do you see the youth climate movement at? Where is it going next? Bill McKibben: This wave has just begun to build, and it's not even close to cresting. This will prove to be the biggest student movement—and the biggest social movement in general—since the end of the war in Vietnam. What do you consider the youth climate movement's biggest task after Power Shift? I think that it will increasingly join with the broader activist movement around climate change exemplified by the new 1Sky coalition. Important as it is to change campus policies, etc., the real fight is over federal policy. What kind of impact do you see the youth climate movement having on electoral politics (especially the 2008 elections)? How can youth maximize their impact? By making it clear that they are casting their votes on one primary issue—the transition to a new energy system. If you could give one piece of advice/say just one thing to the members of the youth climate movement, what would it be? What, in your estimation, will be the biggest deciding factor/have the biggest impact on making positive legislative as quickly as possible? How much political pressure we can muster. So far so good—efforts like StepItUp have changed the Capitol Hill debate a lot already, but they are nowhere near where they need to be be. What are you personally working on after Power Shift? We're trying out figure out how to help support an international grass roots movement. 1--organize. 2--organize. 3--organize. 4--if they have some energy left, by all means change the light-bulbs. What is your favorite aspect of the "1 Sky" Principles? That they've been agreed on by the widest possible range of activists. We have a real chance to have a movement that doesn't factionalize, split apart on the basis of age, etc. This weekend—the culmination of StepItUp, the glory of Power Shift, the launch of 1Sky—will be the most exciting and important few days in the history of the American fight for action against global warming! Thanks Bill for the interview and for all you're doing to help spark a movement, get organized, and make a difference! 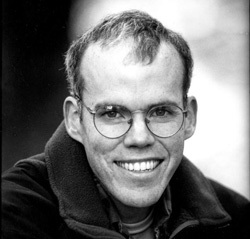 Bill McKibben is an author, environmentalist, activist and educator. His most recent books are Fight Global Warming Now: The Handbook for Taking Action in Your Community and Deep Economy: The Wealth of Communities and the Durable Future. He is a scholar in residence at Middlebury College in Vermont and the co-founder of Step It Up successfully led the organization of the largest demonstrations against global warming in American history. McKibben and the Step It Up crew are at it again, organizing another nationwide day of actions for this Saturday, November 3rd, 2007.